Aprilia surprised us at EICMA 2018 with a middleweight sportbike concept made to tackle both the road and track. It gets a new 660cc parallel-twin motor which makes it an option worth considering for riders upgrading from smaller capacity engines. All in all, it seems like a prospect that should work well in Asian markets, especially in India. Aprilia’s press release mentions the word comfort about three times and indicates an intent for more road use than track. The pictures though tell a different story. This scaled-down iteration of the RSV4 1100 looks more like a supersport than anything else. 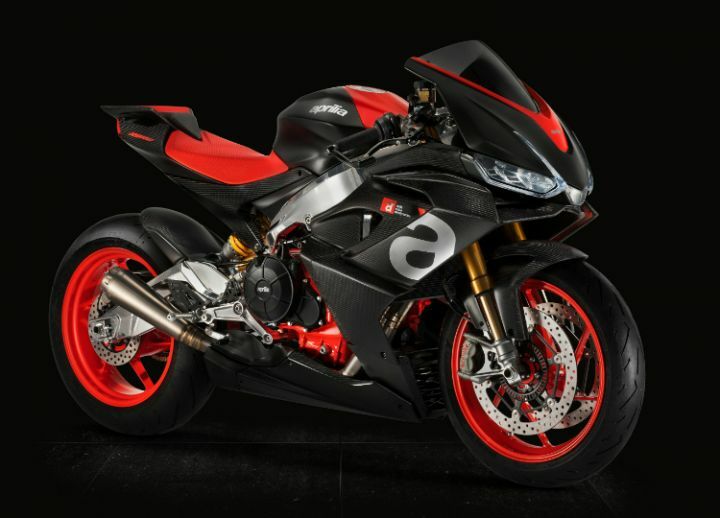 Aprilia states that a lot of engineering has gone into the concept bike to make it more aerodynamic. For comfort, the bike has a wider seat and clip-ons that are mounted on top of the upper steering yoke instead of the forks. The riding position too is said to be optimised for a sporty yet comfortable stance indicating the production bike could be a sports tourer. It seems to feature LED lighting at both ends and a full-digital instrument console, similar to the one on the Aprilia Dorsoduro 900 and Shiver 900. However, the frame appears to be too high-end for just road use. The twin-spar frame uses the engine as a stressed member, while the rear swingarm is bolted directly to the motor. Interestingly, the swingarm is asymmetrical in shape to accommodate the exhaust pipe. We can expect the concept’s adjustable upside down front forks and rear monoshock, as well as the radially mounted Brembo brake setup to make it to the production version, perhaps on a higher Factory variant. Overall, this type of setup seems more suited for the track than road. Powering it is a 660cc parallel-twin motor derived from Aprilia’s 1100cc V4 engine that does duty on the Tuono V4 1100 and RSV4 1100 superbikes. At first glance, it seems like Aprilia engineers have lopped off the V4 1100’s motor and it could be just that. No power output figures have been disclosed but we could expect close to 100PS given the fact that it is based on the V4 that makes a staggering 217PS. Aprilia is also looking at using this 660cc platform to explore other segments. Could that mean a smaller Tuono 660 and a possible resurrection of Aprilia’s midsize Tuareg ADV? The Honda CBR 650F and Kawasaki Ninja 650 could be in for some serious competition as the Italian bikemaker seem to be trying to bridge the gap between middleweight sports tourer and supersport bikes. An entry-level supersport, maybe? Either way, we are excited!